« All you gotta do is dance! 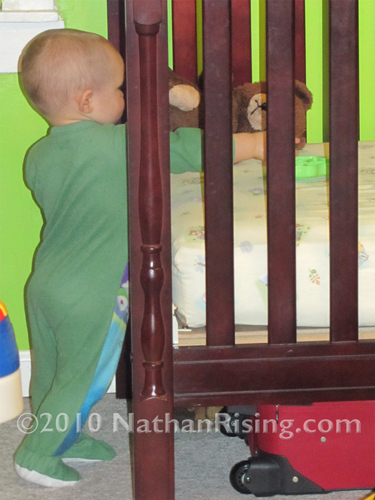 Nathan likes to reach through the crib bars, place a toy in the crib, and reach through the bars to retrieve it. This is really funny when the toy has an awkward shape and has to be turned a certain way to fit through the slats… but not so funny when he can’t get it back out on the first try. This entry was posted by Jen on May 21, 2010 at 8:29 pm, and is filed under Oh the things Nathan does. Follow any responses to this post through RSS 2.0.You can skip to the end and leave a response. Pinging is currently not allowed. He has invented his own shape sorting game just with larger objects! .-= Suzicate´s last blog ..Sundaes, Mountains, Waterfalls, and Strawberries Must Exist In Heaven, Or I Don’t Want To Go There! =-.